It includes 3 pcs top quality brushes with a bamboo wrap. 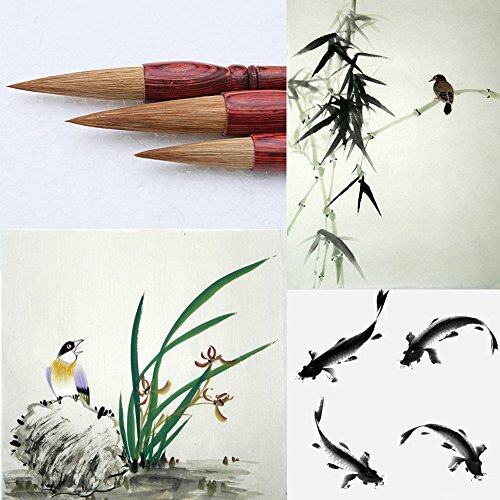 The top quality brushes are good for both painting and calligraphy. Large: Total length: 30 cm; Bristle is 4.9 cm and 1.2 cm in dia. Mid: Total length: 29 cm; Bristle is 4.3 cm and 1.1 cm in dia. Small: Total length: 28.5 cm; Bristle 3.7 cm and 0.9 cm in dia. Most countries' customs do not levy charges like import duty or taxes on traditional suppliers. But it's not easy for us to ensure that for every country in the world since they are subject to change erratically. Thus, it's better to check with your local customs for import tax and duty first if possible. And we'd like to tie in with your import works certainly. Plz kindly note that we don't bear customs fee, etc. Size - Large: Total length: 30 cm; Bristle is 4.9 cm and 1.2 cm in dia. Mid: Total length: 29 cm; Bristle is 4.3 cm and 1.1 cm in dia. Small: Total length: 28.5 cm; Bristle 3.7 cm and 0.9 cm in dia. If you have any questions about this product by Hmay Brush Pen, contact us by completing and submitting the form below. If you are looking for a specif part number, please include it with your message.